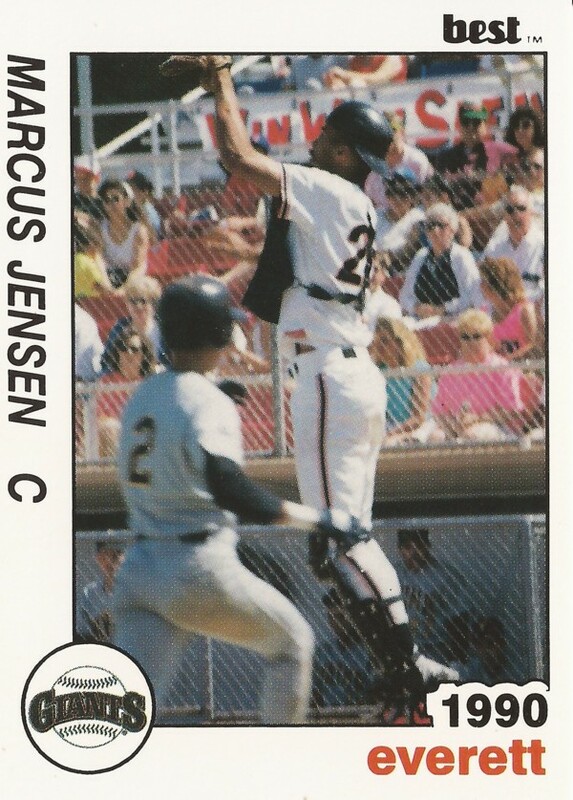 Marcus Jensen had been in the majors before, but he never really caught on. Now, though, in 2001, he was with the Red Sox. He was also hoping to break through any preconceptions that had followed him. "I've been labeled as a defensive catcher," Jensen told The Associated Press that June. "Once you get labeled, 'no-hit' goes with that. I'm working to erase that." Jensen was coming off his most successful season, getting into 52 games with the Twins in 2000. Jensen, though, didn't match that number again, playing just a game with the Red Sox in 2001, and just 27 more major league games in his career as a whole. Jensen's route to the major leagues began back in 1990, taken by the Giants in the first round, 33rd overall, out of Skyline High in Oakland. Jenson started with the Giants at short-season Everett, moving to single-A Clinton in 1992. He didn't make AA, though, until 1995, at Shreveport. Then, in April 1996, Jensen made San Francisco. He got into three games that month, going 1 for 8. The catcher then returned in September, getting into another six games, going 3 for 11. In between, he played at AAA Phoenix. His April time was limited as another player returned from the disabled list. Jensen told The San Francisco Examiner he had been aware he would be one of the first players sent down. "It was just a matter of time," Jensen told The Examiner. "I tried to keep my eyes and ears open and absorb as much as I could while I was here." For 1997, Jensen got into another 38 major league games, 30 with the Giants and eight more after a mid-season trade to the Tigers. That May, the switch-hitting Jensen knocked his first major league home run. Jensen went on to get time in each of the next five major league seasons, getting those 52 games with the Twins in 2000. Jensen hit just .209 that year. But, with the career-high in major league games played, came another opportunity, Jensen told OurSportsCentral two years later, the Olympics. Jensen became part of the 2000 gold medal-winning U.S. Olympic baseball team. "I was sent down from the big leagues and that was tough, but then I was going to the Olympics," Jensen told OurSportsCentral. "So, it was like one opportunity was closing, but another opened." Jensen finished his major league career in 2002, with 16 games with the Brewers. Over seven seasons, Jensen got into a total of 145 major league games. Jensen has since gone on to a career as a coach, serving in recent years as a manager in the Arizona League for the Athletics. In 2015, Jensen served as assistant major league hitting coach in Oakland.